Research & Development Division, HORIBA STEC, Co., Ltd. In this work, we applied post-column reaction gas chromatography (GC) using a flame ionization detector (FID) system to study nitrogen-containing organic compounds (NOCs). The results were subsequently validated. 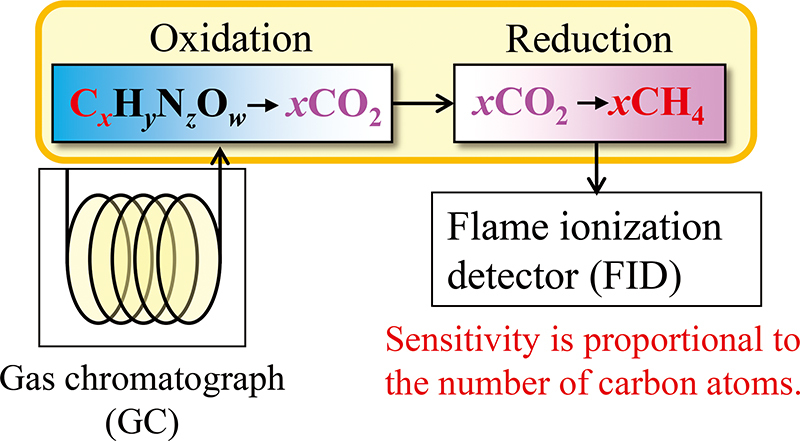 After separation by column, the target components were converted to carbon dioxide using an oxidizing catalyst and then reduced to methane, followed by detection using an FID. SI-traceable testing mixtures containing NOCs (isoprocarb, napropamide, and pendimethalin) were prepared by the gravimetric blending method. These mixtures were analyzed using a post-column reaction GC-FID system; standard materials of hydrocarbons were used as calibrants in this analysis. The determined values were compared with the values obtained for samples prepared at the corresponding concentrations, and statistical analyses were performed in all cases. It was shown that the determined and prepared values agreed well with each other within the uncertainty limits.